The partnership between the Bangladesh government and industry associations allows trainees to gain employable skills. Photo credit: SEIP. Bangladesh trained 1.5 million people by linking directly to the real-world needs of employers. Despite impressive recent growth in the Bangladesh economy – about 6% annually since 2003 and the poverty headcount index sharply down to 31% in 2010 from a high 57% in 1992 – the 2010 labor force survey indicates low education levels. More than 60% of the labor force reported either no education (40%) or have only reached primary education (22.8%). About 2 million young people enter the labor force every year and while their education profile is improving, skills shortage remains one of the main constraints to the growth of economic opportunities in Bangladesh. In order to accelerate its economic growth rates, the government committed to improve skills development and training. It developed the Skills for Employment Investment Program (SEIP) – a skills development program for skilling new entrants and upskilling existing workforce to enhance the productivity and growth of priority industry sectors. A major component of the program is a partnership between the government and the private sector through the country’s various industry associations. Bangladesh’s current skills supply system does not meet the demands of industry and is segmented and poorly coordinated. Skills development faces two major challenges: (i) the significant gap between demand and supply of labor with growing industry demand far outpacing supply; and (ii) weak technical and vocational education in terms of capacity and quality (poor teaching, large number of teacher vacancies, outdated buildings and equipment, curriculum unrelated to the work place, and lack of engagement with the private sector). There is limited involvement of employers and enterprises to provide market responsive training with high labor market outcomes which has resulted in a supply of low-skilled graduates unable to meet domestic and foreign labor market needs. There is a lack of a common financing framework to coordinated skills development with more than 20 ministries and divisions involved in some form of skills training. In addition, the trainings are not well linked with industry and economic development policies. There is limited funding to scale-up skills training to meet the skills required by industry. Funding constraints also limit the government’s capacity to monitor system quality, improve recognition of skills acquired, implement high-quality assessment and certification systems, and expand capacity for preparing trainers and qualifications that meet international industry or trade standards. Geographical inequalities hamper balanced participation across the country with training institutions not located in industrial areas while training centers in remote locations often have no practical exposure to industries. Women and disadvantaged groups are underrepresented. SEIP seeks to improve the alignment of Technical and Vocational Education and Training (TVET) with the country’s skills development systems and the skills demand of the industries. For starters, it identified 6 priority sectors: ready-made garment (RMG) & textile, leather, information technology (IT), construction, light engineering and shipbuilding. Strengthen the curriculum and training. Training standards and curriculum have been developed that address the needs of industries and ensure that the quality of instruction is at par with international standards. For a year, SEIP developed the training modules, in coordination with the industry associations -- 20% theoretical and 80% skills. Standards continue to be developed as industry demands evolve. It also procured equipment (computers, etc.) for classroom and hands-on trainings. Trainers are also being re-trained to build their capacity. SEIP gathered the government’s various skills training programs, and established linkages with the industry associations of the 6 identified priority sectors to co-develop trainings that are suited to their needs. Participating companies also committed to provide employment after trainees complete the course. This also enabled the development of a small entrepreneurs program. The Bangladesh Bank SME Department and PKSF – a network of local nongovernment organizations, teach the entrepreneurship development module in each trade to impart business skills in addition to technical knowledge. Both organizations also have a credit line to extend to the trained workforce. Seek partners to increase funding. A multitrance financing facility composed of loans and grants was set up to fund SEIP. This provided money for procurement of equipment, development of modules, capacity building, training and stipend for the trainees. Industry associations have also committed to share in the training program costs. Encourage participation of disadvantaged groups. In order to encourage participation, SEIP has reserved 30% of the training spots for women while 15% is allocated for disadvantaged and physically challenged groups. SEIP seeks to increase women's participation in TVET. Photo credit: SEIP. Even with initial delays due to the need to procure equipment and craft the modules for the trainings, SEIP representatives are confident they will meet the target for the year. Other industry associations have also been calling the SEIP office asking to be included in the program because they do not want to be left behind. 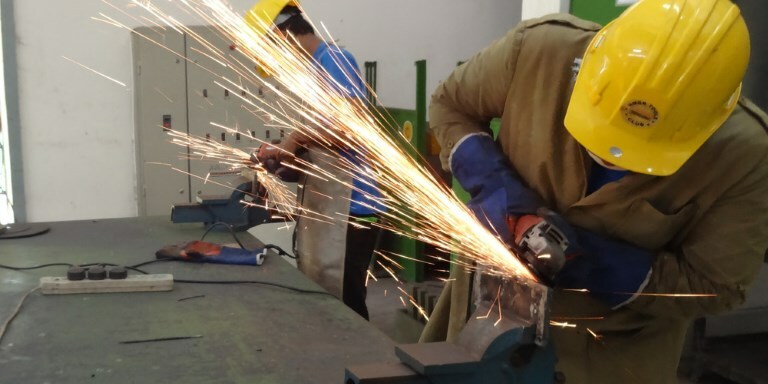 After the SEIP training, certified welders are finding jobs at a higher salary both in Bangladesh and abroad. As of June 2016, 2,000 people are being trained and will be provided with jobs in the Qatar construction sector with zero migration cost. Without SEIP, overseas placement costs an average of $10,000 per person. Select the right candidates for training and seek their commitment. One of the problems that came up after the completion of the first training session was the unwillingness of some of the trainees to move to the cities or areas where the companies were located. At present, prospective participants are now first asked if they are willing to relocate, and make this commitment. Those who decline are asked to apply again when they are ready to relocate. Better dissemination to encourage women and disadvantaged groups to join SEIP. Solicit commitments from industry associations before starting the program. One of the important aspects of SEIP was securing commitments from industry associations to participate in the program – from training the participants to guaranteeing a 70% employment after program completion. Advance preparatory action is needed to avoid start-up delays. Given past delays in procurement activities, practical options should be explored to engage stakeholders to minimize such delays. Align programs with policies and environment. The design of a new project should be aligned with existing policies and industry environment. Commitments and the roles and responsibilities of each stakeholder should be confirmed at the outset, encouraging a sector-wide approach. The project should be designed in a way that it could accommodate innovative ideas and adjust some of the pre-designed activities to cope with changes in situations. ADB. Bangladesh: Skills for Employment Investment Program. Abdur Talukder is a career civil servant, and has been serving in different government positions for more than 28 years. He has specialized in the fiscal policy, macro-economic management and TVET system. He was involved during the preparatory work of the SEIP project and now leading the team for its implementation.